Winner, Merit Plaque, Association of Hispanic-Canadian Professors, 2008. By Guiomar Borrás A., James M. Hendrickson, Stephen Henighan, Antonio Velásquez. 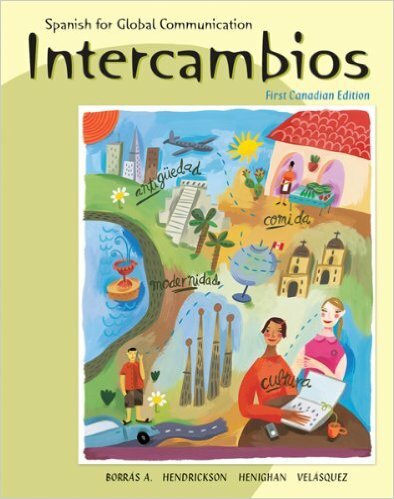 This unique Canadian edition of Intercambios: Spanish for Global Communication makes Spanish more immediate and relevant to Canadian students. It reflects the contexts in which Canadian students live and learn about the language and customs of the Spanish-speaking world and includes an expanded coverage of grammar and vocabulary basics. 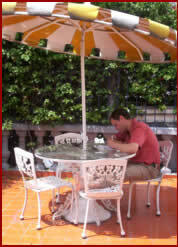 A continuing storyline follows the adventures of three young Canadians who study and travel in Latin America and Spain. The situations these characters find themselves in provide a recognizable context for learning new vocabulary and grammar, while the characters themselves serve as a cultural lens through which the students will learn about Hispanic cultures. This Canadian edition concentrates on profiles of immigrant communities salient in Canadian society, including Canadians of Chilean and Central American heritage. In addition, it includes a chapter on Cuba, a country overlooked by US Spanish textbooks. Whether it be in the “notas de texto” following chapter-opening dialogues, in the brief “Cultura” essays found in each chapter, or through exercises and activities, Intercambios provides a wealth of insights into Hispanic cultures. When I started teaching at the University of Guelph, I became frustrated by the U.S. textbooks we were using in our introductory Spanish language courses. Thomson Nelson agreed to let my colleague Antonio Velásquez and me rewrite the U.S. textbook Intercambios, by Guiomar Borrás A. and James M. Hendrickson, in “Canadian.” I’ve written about this experience in Geist. Intercambios has been a big success. In order to compete with it, other textbook companies have prepared Canadianized versions of their introductory Spanish texts. The result of our initiative is that the majority of Canadian university and community college students will now be taught using textbooks which reflect Canadian realities, Canadian approaches to language-learning and Canada’s relationship with the Hispanic world.